Buckhurst Hill, as the name suggests, takes its name from a local natural feature, recorded as Bocherst(e) in 1135 from the Old English beech (tree) and hyrst, 'a copse' or 'wood' - later to be called Buckhurst. The area has also been called Goldhurst, the gold' referring no doubt to the colour of the trees in the wood. The Hill refers to another nearby feature. 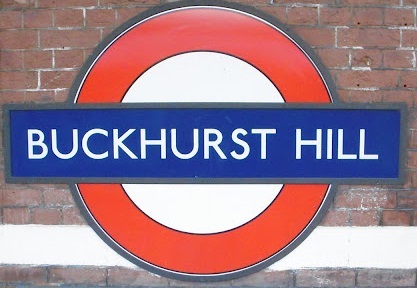 The station was opened as Buckhurst Hill by the Eastern Counties Railway on 22 August 1856 and first used by Underground trains on 21 November 1948.